For the community in Scott County, see Goshen, Scott County, Indiana. Goshen /ˈɡoʊʃən/ is a city in and the county seat of Elkhart County, Indiana, United States. It is the smaller of the two principal cities of the Elkhart-Goshen Metropolitan Statistical Area, which in turn is part of the South Bend-Elkhart-Mishawaka Combined Statistical Area. It is located in the northern part of Indiana near the Michigan border, in a region known as Michiana. Goshen is located 10 miles southeast of Elkhart, 25 miles southeast of South Bend, 120 miles east of Chicago, and 150 miles north of Indianapolis. The population was 31,719 at the 2010 census. Location of Goshen in Elkhart County, Indiana. The city is known as a major recreational vehicle and accessories manufacturing center, the home of Goshen College, a small Mennonite liberal arts college, and the Elkhart County 4-H Fair, one of the largest county fairs in the United States. Goshen was platted in 1831. It was named after the Land of Goshen. The initial settlers consisted entirely of old stock "Yankee" immigrants, who were descended from the English Puritans who settled New England in the 1600s. The New England Yankee population that founded towns such as Goshen considered themselves the "chosen people" and identified with the Israelites of the Old Testament and they thought of North America as their Canaan. They founded a large number of towns and counties across what is known as the Northern Tier of the upper midwest. It was in this context that Goshen was named. They were aided in this effort by the construction and completion of the Erie Canal which made traveling to the region much easier, causing an additional surge in migrants coming from New England. Added to this was the end of the Black Hawk War, which made the region much safer to travel through and settle in for white settlers. These settlers were primarily members of the Congregational Church, though due to the Second Great Awakening, many of them had converted to Methodism, and some had become Baptists before coming to what is now Indiana. The Congregational Church has subsequently gone through many divisions, and some factions, including those in Goshen, are now known as the Church of Christ and the United Church of Christ. When the New Englanders arrived in what is now Elkhart County there was nothing but dense virgin forest and wild prairie. They laid out farms, constructed roads, erected government buildings and established post routes. 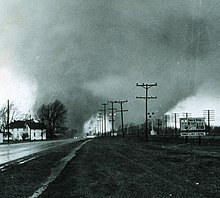 This double tornado hit the Midway Trailer Court northwest of Goshen on U.S. 33, Palm Sunday, 1965. On Palm Sunday, April 11, 1965, a large outbreak of tornadoes struck the Midwest. The most famous pair of tornadoes devastated the Midway Trailer Park (now inside the city limits of Goshen), and the Sunnyside Housing Addition in Dunlap, Indiana, but a smaller F4 tornado also struck neighborhoods on the southeast side of Goshen on the same day. Statewide, 137 Hoosiers died in the storms—55 of them in Elkhart County. Days later, President Lyndon B. Johnson visited the Dunlap site. The Goshen Historic district, added in 1983 to the National Registor of Historic Places is bounded by Pike, RR, Cottage, Plymouth, Main, Purl, the Canal, and Second Sts. with the Elkhart County Courthouse at its center. In April 2006, Goshen was the site for an immigration march. Officials estimated that from 2000 to 3000 people marched from Linway Plaza to the County Courthouse. For much of its history, Goshen was a "sundown town", forbidding African Americans from living in, or entering, the town, often under threat of violence. In March 2015, the city acknowledged this part of its past, apologizing and saying that it no longer condones such behavior. The Elkhart County Courthouse, Fort Wayne Street Bridge, Goshen Carnegie Public Library, Goshen Historic District, William N. Violett House, and Violett-Martin House and Gardens are listed on the National Register of Historic Places. Goshen is located at 41°34′55″N 85°50′12″W﻿ / ﻿41.58194°N 85.83667°W﻿ / 41.58194; -85.83667. The Elkhart River winds its way through the city and through a dam on the south side making the Goshen Dam Pond. Rock Run Creek also runs through town. The city is divided east/west by Main Street and north/south by Lincoln Avenue. According to the United States Census Bureau, the city has a total area of 16.59 square miles (42.97 km2), of which 16.23 square miles (42.04 km2) is land and 0.36 square miles (0.93 km2) is water. Elkhart County courthouse in Goshen. As of the census of 2010, there were 31,719 people, 11,344 households, and 7,580 families residing in the city. The population density was 1,954.3 inhabitants per square mile (754.6/km2). There were 12,631 housing units at an average density of 778.3 per square mile (300.5/km2). The racial makeup of the city was 78.2% White, 2.6% African American, 0.5% Native American, 1.2% Asian, 14.8% from other races, and 2.7% from two or more races. Hispanic or Latino of any race were 28.1% of the population. There were 11,344 households of which 36.1% had children under the age of 18 living with them, 47.4% were married couples living together, 13.1% had a female householder with no husband present, 6.3% had a male householder with no wife present, and 33.2% were non-families. 27.4% of all households were made up of individuals and 13.2% had someone living alone who was 65 years of age or older. The average household size was 2.67 and the average family size was 3.23. The median age in the city was 32.4 years. 27.4% of residents were under the age of 18; 11.3% were between the ages of 18 and 24; 26.1% were from 25 to 44; 20% were from 45 to 64; and 14.9% were 65 years of age or older. The gender makeup of the city was 48.9% male and 51.1% female. As of the census of 2000, there were 29,383 people, 10,675 households, and 7,088 families residing in the city. The population density was 2,227.7 people per square mile (860.1/km²). There were 11,264 housing units at an average density of 854.0 per square mile (329.7/km²). The racial makeup of the city was 83.15% White, 1.53% Black or African American, 0.26% Native American, 1.10% Asian, 0.02% Pacific Islander, 12.00% from other races, and 1.94% from two or more races. 19.33% of the population were Hispanic or Latino of any race. There were 10,675 households out of which 32.6% had children under the age of 18 living with them, 50.8% were married couples living together, 10.1% had a female householder with no husband present, and 33.6% were non-families. 27.5% of all households were made up of individuals and 12.5% had someone living alone who was 65 years of age or older. The average household size was 2.61 and the average family size was 3.14. In the city, the population was spread out with 25.9% under the age of 18, 12.9% from 18 to 24, 30.0% from 25 to 44, 17.6% from 45 to 64, and 13.6% who were 65 years of age or older. The median age was 32 years. For every 100 females, there were 100.6 males. For every 100 females age 18 and over, there were 97.7 males. The median income for a household in the city was $39,383, and the median income for a family was $46,877. Males had a median income of $32,159 versus $23,290 for females. The per capita income for the city was $18,899. About 6.0% of families and 9.3% of the population were below the poverty line, including 11.8% of those under age 18 and 5.3% of those age 65 or over. Industry in Goshen centers around the automotive and Recreational Vehicle business. There are automotive component manufacturers like Benteler; firms that build custom bodies onto chassis like Supreme, Independent Protection and Showhauler Trucks. RV manufacturing companies include Dutchmen, Forest River and Keystone. The government consists of a mayor, a clerk treasurer, and a city council. The mayor and clerk are elected in citywide vote. The city council consists of seven members. Five are elected from individual districts. Two are elected at-large. Goshen Community Schools serves the portion of the city in Elkhart Township. This system consists of seven elementary schools, Goshen Middle School, and Goshen High School. In 2012, U.S. News & World Report ranked Goshen High School as the 12th best high school in Indiana, as well as in the top 6% of high schools in the entire country. Additionally, Goshen is served by Bethany Christian Schools, a private Christian school for grades 4-12. Small parts of the city of Goshen are covered by several other school districts, including Fairfield Community Schools, Middlebury Community Schools, Concord Community Schools, and WaNee Community Schools. Goshen College, located on the south side of town, has a current enrollment of approximately 800, with 40% being male, and 60% being female. Tuition and fees for the 2017–2018 year were $33,200. The town has a free lending library, the Goshen Public Library. Goshen Municipal Airport is a public use airport located three nautical miles (6 km) southeast of the central business district of Goshen. It is owned by the Goshen Board of Aviation Commissioners. The Interurban Trolley bus connects Goshen to the nearby city of Elkhart and the unincorporated town of Dunlap via Concord and Elkhart-Goshen routes. The routes pass at Elkhart's Amtrak station, allowing passengers to connect to the Capitol Limited and Lake Shore Limited trains. Riders can also transfer to North Pointe route and Bittersweet/Mishawaka route. The former allows riders to connect to Elkhart's Greyhound bus station, while the later connects the riders to the city of Mishawaka and town of Osceola. The Bittersweet/Mishawaka route also allows them to transfer to TRANSPO Route 9 to connect to destinations throughout the South Bend-Goshen metropolitan region and the South Shore Line's South Bend International Airport station. Cruising on First Friday, July 2011. Goshen has seven parks and has a few different greenways and trails winding through the city, one of which runs along the old Mill Race and hydraulic canal which was once used to power an old hydroelectric power plant. Plans drawn up in 2005 call for the plant to be reopened and redevelopment to begin along the canal. The Pumpkinvine Nature Trail runs from Goshen to Middlebury and Shipshewana, along the former Pumpkin Vine Railroad. The trail starts north east of Goshen at Abshire Park. It is one of the recreational highlights of Goshen. Along with the Maple City Greenway and the Millrace trail, they provide many miles of easily accessible trails for walking, running, and biking. The Elkhart County Fairgrounds are also located in the city, where in late July, the Elkhart County 4-H Fair is held. It is the largest county fair in Indiana and one of the largest 4-H County Fairs in the United States. The Goshen Air Show is also an annual event that takes place at the Goshen Municipal Airport. In 2007, Downtown Goshen, Inc., a public-private partnership formed from the merger of Face of the City and the Downtown Action Team, started a First Fridays program. Occurring year round, First Fridays happens on the first Friday of each month with stores open until 9, music and other entertainment, and other events occurring within Goshen's downtown district. The south side Wal-Mart is rumored to be the first Wal-Mart in the United States to provide a covered stable for its frequent Amish customers. The Amish built the stable with lumber and other supplies donated by Wal-Mart. Lonesome Jim (2005) which was written by former resident James Strouse, directed by Steve Buscemi and starred Liv Tyler and Casey Affleck, was shot in Goshen. Goshen has two sister cities as designated by Sister Cities International. ^ "Mayor's Office". City of Goshen, IN. Retrieved January 6, 2016. 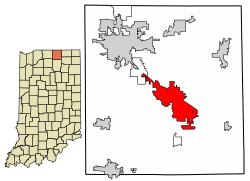 ^ History of Elkhart County, Indiana. Chas. C. Chapman Co. 1881. p. 884. ^ "Weather Events: 1965 Palm Sunday Tornado Outbreak Part II: Sunday Evening". Islandnet.com. Retrieved August 27, 2017. ^ "National Register of Historical Places - INDIANA (IN), Elkhart County". Nationalregisterofhistoricplaces.com. Retrieved August 27, 2017. ^ "Bulletin Issue Archives - News & Events - Goshen College". News & Events. Retrieved August 27, 2017. ^ "A RESOLUTION ACKNOWLEDGING THE RACIALLY EXCLUSIONARY PAST OF GOSHEN, INDIANA, AS A 'SUNDOWN TOWN'". March 2015. Retrieved March 27, 2015. ^ "Manufacturers - Goshen Chamber of Commerce". business.goshen.org. Retrieved August 27, 2017. ^ "Goshen High School in GOSHEN, IN - Best High Schools". Usnews.com. Retrieved August 27, 2017. ^ "Goshen College in GOSHEN, IN". Usnews.com. Retrieved November 24, 2017. ^ FAA Airport Master Record for GSH (Form 5010 PDF). Federal Aviation Administration. Effective May 31, 2012. ^ "Goshen Chamber of Commerce" (PDF). goshen.org. Retrieved August 27, 2017. ^ "Welcome to the Official Site For Elkhart County, INDIANA". Elkhartcountyindiana.com. Archived from the original on July 1, 2007. Retrieved August 27, 2017. ^ "Raising the barn in Amish country". Discount Store News. 1999. Archived from the original on July 8, 2012. Wikivoyage has a travel guide for Goshen. Wikisource has the text of a 1911 Encyclopædia Britannica article about Goshen, Indiana. Goshen on citydata.com – collection of statistics and graphs of Goshen demographics.